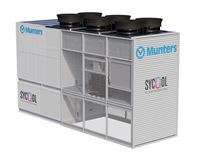 Munters Group, a global leader in energy-efficient air treatment and climate solutions, announces today the launch of an exciting new cooling technology into the Data Centre industry. SyCool® ITC, Indirect Thermosiphon Cooling, provides an efficient cooling solution for new and existing data centers where access to a suitable water supply may be limited, expensive or unreliable. With a nominal capacity of 250kW, the P250 packaged system will be the first pump-free system to market, offering a best-in-class dry cooling solution and boasting features such as HFO refrigerant-ready; oil-free, low pressure thermosiphon circuits; no moving parts; zero water consumption and significant energy savings compared to the most efficient pumped refrigerant systems currently available on the market.